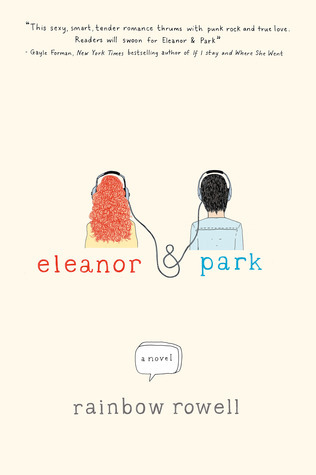 Eleanor & Park made me want to return to high school. That is an achievement I would have previously believed impossible. But this book made me feel the way I suspect everyone feels falling in love for the first time: giddy and confused; hopeful and anxious. It’s so deceptively simple; Rowell alternates between Park and Eleanor’s perspectives as they navigate their first intimate relationship, using sparse, poetic language to spotlight their emotions. I read this with a smile crinkling my face. I tried to turn down the corners of my mouth when a character blurted “I love you” too soon. I tried to dismiss effusive descriptions like “Park was the sun” as trite. I tried—I tried so hard—to channel my inner cynic, to view this story as humdrum teenage romance muck. I failed. And so I read this story smiling. From the moment Eleanor and Park fatedly meet on a yellow school bus and commence their relationship, their story is impressively realistic. They start by talking about everything for every hour of every day. That leads to the touching, beginning with accidental nudges and proceeding, slowly so slooooowly, to purposeful brushes of the fingers. By the time they’re in love, they barely even recognize it. It’s too late for them to wonder if the eventual pain will be worth it. Once the protagonists’ hearts are stolen, my excited heart flutters mostly stopped and my anxiety increased because I knew there would be an end to their story; I knew it couldn’t stop with them holding hands, reading comics, and laughing together on the bus. I was right. Eleanor and Park capture the sweetness and purity of first love and try to hold it as tightly as they can. They fail. And there is so much beauty in that.